Very similar to and easily confused with slightly bigger European Golden in all plumages. Best separated by generally slimmer structure, voice and underwing. Compared with European Golden, wings often (but not always) protrude 1-2 cm beyond tail-tip (most obvious in adult), bill is finer and longer, legs are clearly longer, particularly thighs, making it appear more elegant; in flight, toes extend beyond tip of tail (never in European Golden), wings appear longer and narrower than European Golden’s, and underwing and axillaries are greyish brown in all plumages (white in European Golden). Adult breeding similar to European Golden; non-breeding and immature have rather distinct yellow-buff supercilium (more indistinct in European Golden). Flight pattern above uniform blackish brown speckled golden, faint, nearly absent, wing-bar (slighter than in European Golden) most obvious in primaries. Larger Grey Plover has grey appearance, stronger bill and, in flight, white rump and black axillaries. 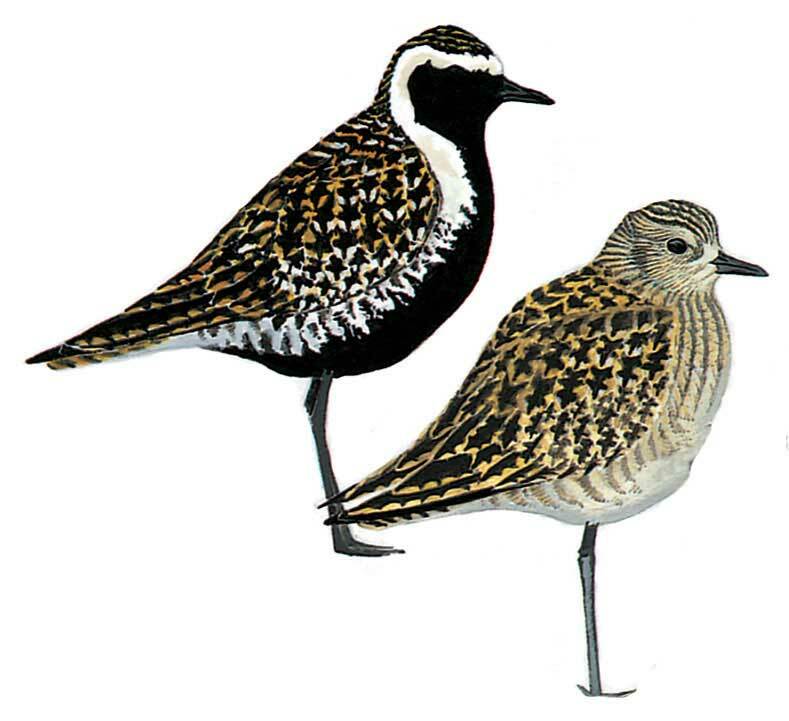 For separation from American Golden Plover see that species.